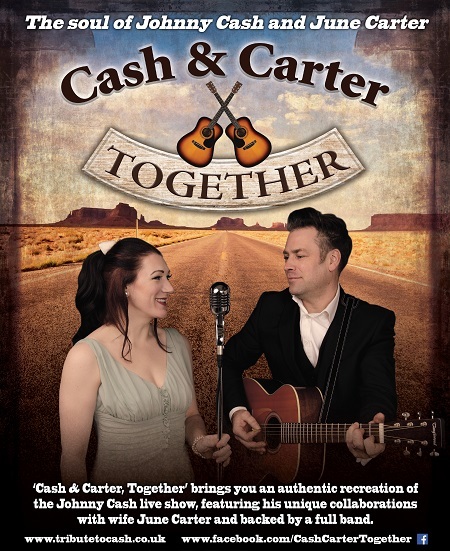 Cash & Carter, Together’ brings you an authentic recreation of the Johnny Cash live show, focusing on his unique collaborations with wife June Carter, and backed by a full band playing country, rockabilly, gospel and folk. Featuring images and stories, the show captures the soul of the Cash-Carter legacy with feeling, honesty and humour. The show features a set list of the best of Cash, and Carter, including Folsom Prison Blues, Jackson, Get Rhythm, Carter family bluegrass, and delves into the magnificent American Recordings series, including Hurt, which brought Johnny to a whole new generation of fans.